SuperCasino is the leading brand of NetPlayTV and is currently the longest-running online televised casino in the United Kingdom. Founded in April 2005, the world-renowned casino offers Channel 5 live games. Its excellent gaming library includes live dealer blackjack, live dealer baccarat, live roulette, slot machine games, plus an impressive assortment of casino table & card games, several video pokers and fun arcade games. 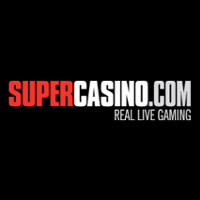 Whether players are looking for a pass the time quick game or a social casino experience, SuperCasino operated and owned by NetPlayTV Group Limited offers the closest experience you could get to brick and mortar casinos. With total security guaranteed, the casino offers much more than just exceptional games. Peace of mind comes with all transactions safeguarded via 256-bit SSL encryption. Heart-thumping gaming on both PC, TV, and mobile ensure that every player wants to feel the adrenaline of playing, again and again. The welcome package is exclusive to new depositing members and starts off with a 100% deposit of up to £200 allowing new members sufficient funds to experiment the casino with. The bonus can be used to enjoy fabulous gaming on TV, Desktop or mobile online games. To qualify for this exceptional bonus, registrations and an initial £10 minimum deposit are required. The bonus and deposit are subject to wagering of 25 times before withdrawals can be granted and you’ll have 30 days in total to meet these requirements. Existing members are spoiled with never-ending bonus excitement, and additional funds can be earned from tournaments, promotions, and competitions. SuperCasino offers several gaming options in its Casino, Vegas, and Live sections. Visiting the Casino section offers an incredible variety of slots, table & card games, progressive jackpots and live casino games. Enthralling play awaits for all slot fanatics with the wide variety of top creation from Playtech, which includes the branded Marvel range, the brand new Age of Gods series and all the other exceptional titles part of the gaming library of one of the world’s most talented software developers. Top titles showcased in the featured game section include Ace Ventura Pet Detective, Kong the 8th Wonder of the World and Frankie Dettori’s Magic Seven Jackpot. The progressive jackpot section is jam-packed with massive payouts offered by Jackpot Giants, Gold Rally, Gladiator, and the Marvel progressive jackpot. Live play becomes a must with the gaming selection offering Double Up Roulette, Roulette Express Premium, and Live Roulette to name only a few, plus the card and table game section bursts out with games such as 21 Duel Blackjack, Roulette Pro, and Mini Roulette. SuperCasino utilises 256-bit SSL digital encryption to provide all players complete protection in all exchange of information as well as financial transactions. The technology is currently the most modern and the very best available to provide major security and is used by major financial institutions. Being the UK’s longest running roulette TV show, SuperCasino has millions of members trusting them to always provide the most consistent services available. SuperCasino is for every player who is seeking the most fantastic online casino experience that offers gaming as real as brick and mortar casinos, a gaming dream destination where players can enjoy roulette and blackjack with the world’s best croupiers to test their skill against global players.